ACNE PRONE SKIN? REACH FOR VICHY. Right, let me just call out to everyone out there with acne-prone skin, I know there are loads of you. I've found three products that have dramatically transformed my skin and I have to share them. * Note: These products have recently been re-branded so they might have slightly different packaging! I use three of the product from the Anti-Imperfection range by Vichy. The first is the Vichy Noraderm 3-in-1 Micellar Solution. 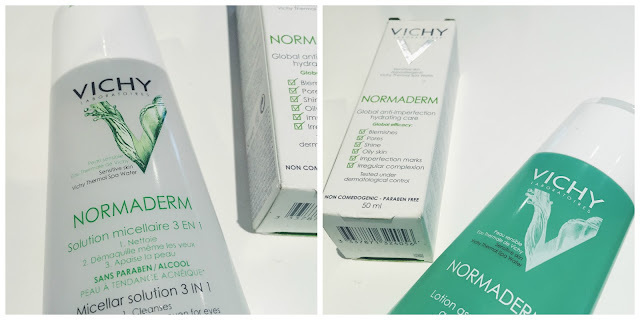 Vichy's description of the product goes something like this: "Cleanses and purifies without rinsing, Vichy Normaderm Micellar Solution is also suitable for use on acne prone skin. It cleanses impurities, sebum and make-up. It also soothes sensitive skin." This product refreshes and cleans my face unlike any other product I've tried, I've literally gone through so many bottles I love it so much. It's around £11 a bottle, which I know is expensive for make up remover (especially for those students out there, am I right? ), but the results have made me so much more comfortable with my skin that I think it's worth every penny - so many people have noticed and I am so much happier going out without any makeup on. 10/10. Hands down. This moisturiser is called the Anti-blemish care day cream. However, I do this routine once a day, in the evening, and I've got amazing, fast results from letting it soak in overnight. I'd like to say this moisturiser is the icing on the cake. It's not sticky or greasy, it soaks in straight away and you're ready to go. Vichy says it 'Combats signs of imperfection-prone skin, including hormonal imperfections', and 'Skin looks radiant, hydrated and beautiful', and I couldn't agree any more. So there you go. A good skincare routine is essential, and I love how I've got mine covered in three steps. As with any new product you have to give this a week or so to get your skin used to it - I had some breakouts but I powered through those and the results are amazing. Note: you can buy these products from Boots. WHAT I GOT FOR MY BIRTHDAY 2016!